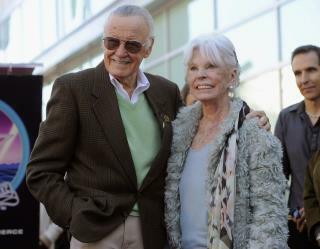 (Newser) – Sad news in the world of comics: Joan Lee, the wife of industry legend Stan Lee, is dead at age 93, reports Variety. She had a stroke last week and never recovered. Lee himself is 94 and had been married to Joan for 69 years. Her death prompted the Hollywood Reporter to recount how Stan Lee met his future wife, then a British hat model living in New York, back in the 1940s. A friend had told him about another hat model, but when he went to ask her to lunch, Joan answered the door. After the first sentence of this short bio, I thought, 'Hollywood institutional has a normal life. Interesting.' Last sentence; they married in Reno ONE HOUR AFTER HER DIVORCE! Sad but amazingly long time. 69 years from now I don't think we will see a marriage last that long, with or without death.